When I made Hamantaschen, I ended up with leftover filling — a filling so delicious, I started casting about for another way to use it up. A recipe for date swirls in The Gourmet Cookie Book caught my eye, and after a little tinkering, this cookie was born. Though it looks fancy, it's not hard to make; it tastes like a really splendid Fig Newton. Make the filling: Place the poppy seeds in a small saucepan and cover with the milk. Simmer for a couple of minutes, stirring occasionally, then turn off heat and let cool. Place the sugar, dates or figs, raisins, nuts (both the walnuts and ground almonds), lemon or orange zest, and egg yolk in a bowl, and add the poppy seed-milk mixture. Transfer to a food processor with a steel blade and pulse until just combined. Refrigerate until the filling is chilled. Make the dough: In a medium bowl, whisk together the flour, baking powder, baking soda, and salt; set aside. Cream together the butter, cream cheese, and sugar until light and fluffy. Add the vanilla, egg yolk, and flour mixture; beat just until a dough forms. Shape the dough into a disk, wrap it in waxed or parchment paper, and chill for 1 hour. Shape the dough: Remove the cookie disk from the paper and lightly flour the paper. Place the disk on top of the paper and roll out the dough into a large rectangle (13 inches by 10 inches) about ⅓ inch thick. 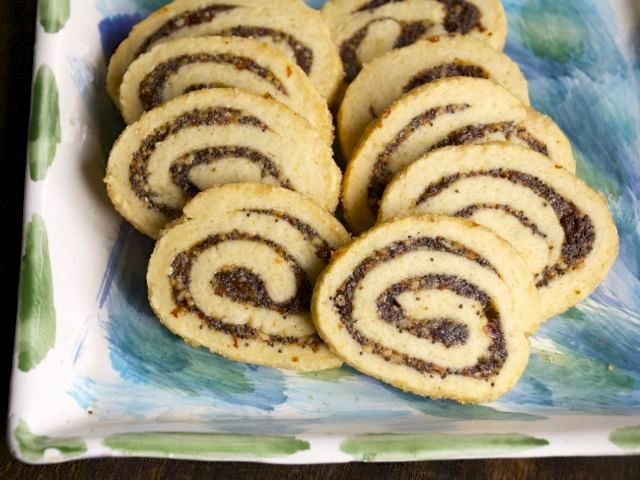 Drop the poppy-seed mixture by spoonfuls onto the dough and gently spread the filling out to cover the dough, leaving a ¼ inch border (fingers work well). Starting with the long side, roll the dough jelly-roll style into a log, using the paper to help. Brush any excess flour from the paper; roll the log in coarse sugar to coat, if you want. Wrap up the cookie log and chill for several hours or overnight. Bake the cookies: Preheat the oven to 350 degrees and line 2 baking sheets with silicone mats or parchment paper. Slice the log into ⅓-inch-thick cookies and arrange the cookies on the baking sheets about 1½ inches apart. Bake the cookies in the middle of the oven for about 15 minutes, until pale golden. Cool on racks.